nj arts maven: SCROOGE RETURNS TO McCARTER THEATRE CENTER FOR THE HOLIDAYS! SCROOGE RETURNS TO McCARTER THEATRE CENTER FOR THE HOLIDAYS! Theatre Center Ticket Office, located at 91 University Place in Princeton. Follow Ebenezer Scrooge on a magical journey through Christmas past, present, and future and watch as our entire community—including members from the greater Princeton area—bring this story to life around you! This exciting production will usher you into the spirit of the season with all the joy, wonder, and generosity that Scrooge himself discovers. 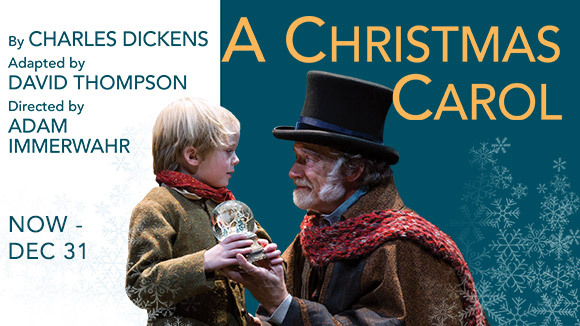 Share the happiness of Dickens' perennial masterpiece and join us in celebrating this McCarter tradition with your friends and entire family. Ebenezer Scrooge (Greg Wood) is no fan of Christmas. He “bah humbugs" every glimmer of holiday happiness. Cheer is costly and good-will is bad for business. This Christmas, however, things are going to be a little different. In a new look at an annual McCarter tradition, this exciting new production will usher you into the spirit of the season with all the joy, wonder, and generosity Scrooge discovers. audiences will experience an immersive Dickensian environment from the opening of the theater doors to the final bows. Adults and children will meet Dickensian characters and discover new surprises in the lobbies during the pre-show; and enjoy a myriad of enhanced special effects and new dance numbers on stage. Carol remains a heartwarming tale of redemption, hope, and love. McCarter’s latest reimagining of this annual tradition has been honored with acclaim by audiences and critics alike, praising the Community Ensemble, in particular. Home from the Wars), sound design by Darron L West (Tony Award – Peter and the Starcatcher), and special effects by Jeremy Chernick (Harry Potter and the Cursed Child). Musical Direction is by Charles Sundquist, who is celebrating his 25th and final year with the show. The 2017 production of A Christmas Carol is dedicated to the memory of composer Michael Friedman. With an impressive roster of Broadway, regional and international credits, the cast of A Christmas Carol features returning McCarter Carol veterans Jessica Bedford, Anne L. Nathan, Jamila Sabares-Klemm, Sue Jin Song, and Greg Wood. Newcomers include Zeke Edmonds, Michael Genet, Christopher Livingston, Jon Hudson Odom, Jon Norman Schneider, and Thom Sesma. After an extensive audition process, McCarter is proud to announce members of the 2017 Community and Young Ensembles: Riley Altobelli of Lambertville, NJ; Amy Blair, Jen Ericksen, and Tara Parkman of Ewing, NJ; Mariah Crawford, Melda Grant, Bryanna Martinez-Jimenez, and Shan Williams II of Trenton, NJ; David Danner of Newtown, PA; Jose Dominguez of Edison, NJ; Lew Gantwerk and Sarah Rajkumar of Princeton, NJ: Rosie and Scott Karlin of Plainsboro, NJ; Thom Kummerle of Princeton Junction, NJ; Al LaGratta of Kendall Park, NJ; Valencio Lazarczyk of Whitehouse, NJ; Aimée Miller of New Hope, PA; Mikal Odom of Yeadon, PA; Gloria Schnure of Somerset, NJ; Susan Schwirck and William Hart Strecker of Monroe Twp., NJ; and Henry Miles of Hamilton, NJ. In addition, two Community Ensemble members are cast in major roles for this production: Mimi B. Francis of North Brunswick, NJ returns as the Ghost of Christmas Present, and Tess Ammerman of Princeton, NJ will feature in the roles of Fan and Miss Kate. and Camille Grove, Romy Johnson, Michael Karnaukh, Xander Kurian, Stefan Naumoski, and Julianna Pallacan of Princeton, NJ. *The production running time is two hours with one 15-minute intermission. Saturday December 9 2 p.m.
Sunday December 10 1 p.m.
Sunday December 10 5:30 p.m.
Thursday December 14 7:30 p.m.
Friday December 15 7:30 p.m.
Saturday December 16 7:30 p.m.
Sunday December 17 5:30 p.m.
Wednesday December 20 7:30 p.m.
Thursday December 21 7:30 p.m.
Friday December 22 7:30 p.m.
Saturday December 23 2 p.m.
Saturday December 23 7:30 p.m.
Sunday December 24 4:00 p.m.
Tuesday December 26 2 p.m.
Wednesday December 27 1 p.m.
Wednesday December 27 5:30 p.m.
Friday December 29 7:30 p.m.
Saturday December 30 2 p.m.
Saturday December 30 7:30 p.m.
by reading a portion of the book. All reading levels are welcome. For more information and to sign up, visit www.princetonlibrary.org. The Fezziwig Parties – Tuesdays, December 5 and 19 at 6 p.m. Enjoy hearty appetizers while sipping on holiday inspired cocktails in a family atmosphere fit for all Dickens enthusiasts prior to these performances! Please note: cash bar for alcohol. cocktail reception. Afterwards stroll and carol your way over to McCarter for a 7:30pm performance of A Christmas Carol. Meet and Greet with Scrooge - Thursday, December 28, 2017 – 2 p.m.